Brooks Mountains Range, ANWR, Alaska. Here’s another image from the summer just gone by. 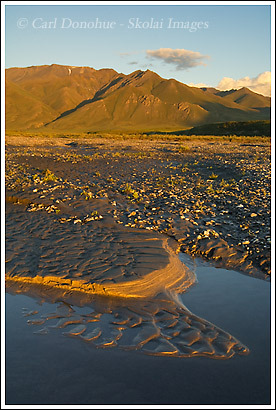 This one was from near our campsite on the Canning River, in the Arctic National Wildlife Refuge (ANWR). We’d had a nice day paddling, enjoying some sunny weather, found a sweet spot to camp, and then I wandered around into the evening looking for a composition that caught my eye. The unnamed mountain across the river is a ridge leading up to Mt. Salisbury. This is one of my favorite areas in the region, right at the edge of the coastal plain and the Brooks Mountains. Typically these kinds of terrains are interesting; where two different ecosystems come together – well, what we think of as two different ecosystems anyway. But the transition from one landform to another is often home to a wealth of diverse and interesting features and creatures. The next day, for example, we saw a herd of muskox along the river. The birds in this area were cool too, we saw merlin, gyrfalcon, golden eagles, arctic tern, gulls, as well as shorebirds like Tattlers, Sandpipers, and plovers, and waterfowl like Mergansers, loons, Harlequin ducks and more. It was very cool. Traveling and photographing in the arctic is hard work; trying to travel during the day when it was a little warmer meant being tired at night when the light was nicer. So we had to compromise a bit for that. What’s REALLY hard is trying to sleep in the morning when the sun comes up and is bright and hot by 7am – that’s a tough gig when you’ve been out photographing the night before until after 4 in the morning. When the weather was cloudy and cool it meant I could finally catch up on some rest. The sun doesn’t even go close to setting this far north in the summer, this is about as dark as it gets. It means long nights of soft warm sun, which is great to hike and photograph in. For backpacking trip or hiking, it’s awesome, but for rafting, it’s a little cool. So we’d generally paddle during the day, until late, setup camp, eat and then photograph a while. It worked for me, but Bob, one of the folks on the trip, was more of a ‘wake up and get out of bed at 5am’ type fella – regardless of what time we crashed out the night before. I don’t know how he does it. I really like sidelighting for landscape photos, so enjoy shooting in this area when the sun is low to the horizon. Shortly after this shot, the sun climbed higher as I sunk lower (into my sleeping bag). Good times. This entry was posted in Adventures, Alaska, ANWR, Backpacking and Hiking, Environmental Issues, Landscapes, Rafting, Travel and tagged ANWR, Arctic National Wildlife Refuge, Brooks Mountains, hiking, Landscapes on November 2, 2008 by Carl D.
That’s wild looking. I hope this doesn’t sound stupid, but it almost looks like lava ,or the remains of it, spreading out over the water. What is that,Carl? I think this pic is very cool. Love the terrain! P.S. I know you didn’t get enough sleep! But it sure was fun, wasn’t it??? Thanks for the post. What you’re seeing there is just sand, rippled from water. This is part of the broad river channel that moves around the valley floor with fluctuating water levels. The river is just over the edge of the sand, you can see the brush line on the far riverbank. And yes, it was awesome fun. It’s amazing walking around up north throughout the ‘night’. Man, that’s a trip! It doesn’t even look like sand, I guess because it looks so dark & smooth.I bet it is a trip at night. Do you hear any wildlife?